The video conferences are run by the Pentagon… [and] a parallel, more cloistered selection process at the C.I.A. focuses largely on Pakistan. Claims like these not only resonate with Giorgio Agamben‘s mapping of the space of exception; they also intersect with the debate over the ‘unitary executive’ that was renewed (and radicalised) during the Bush administration. But if we narrow the focus there is in fact an historical precedent for what Becker and Shane called the ‘Terror Tuesday’ meetings and the close control exerted by the executive over air strikes – and this also took place on a Tuesday. Targets were first proposed by the Air Force and submitted to the Commander-in-Chief Pacific Command (CINPAC), whose office reviewed and forwarded a target list to the Joint Chiefs of Staff who in turn reviewed and forwarded their revised list to the Pentagon. There officials analysed the targets in relation to the probable impact of a strike and the likelihood of civilian casualties, and the Secretary of Defense coordinated the modified list with the Secretary of State. By this stage the folder for each numbered target had been reduced to a sheet of paper with just four columns: military advantage; risk to US aircraft and crew; estimated civilian casualties; and danger to third-country nationals (Russian and Chinese advisers). The final target list was decided during the President’s Tuesday luncheon at the White House. 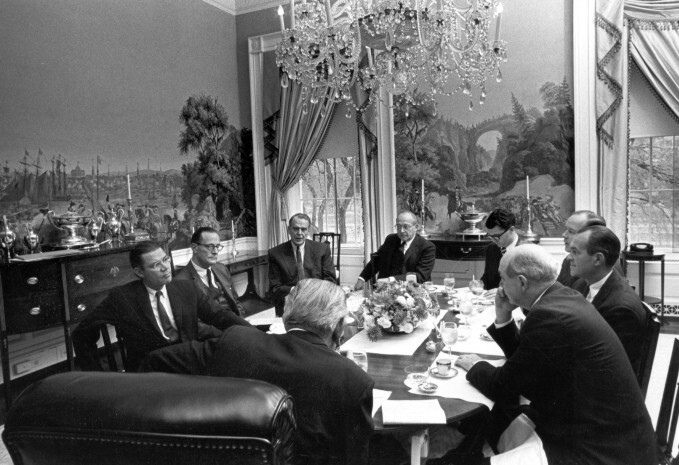 This was not a casual affair; it followed a meeting of the National Security Council, and those attending the luncheon – the Secretaries of State and Defense, the President’s special assistant for national security affairs, and (significantly) the President’s press secretary – were briefed before grading each target. Their grades were combined and averaged and then reviewed by the President who made the final selection. His decision was delivered to the NSC in the evening and transmitted to CINCPAC through the Joint Chiefs for immediate execution. The instructions included not only the number of sorties to be conducted against each target but also in the early stages of the campaign the timing of the attacks and the ordnance to be used. 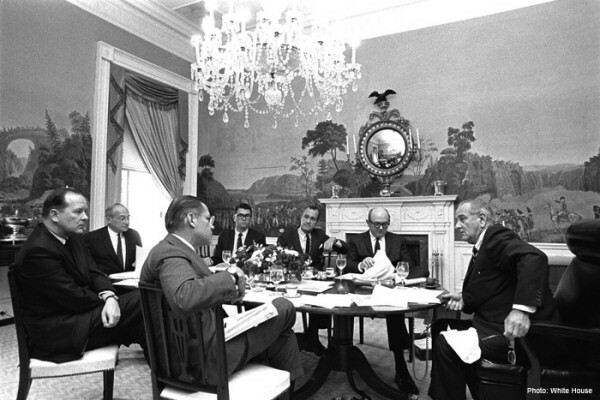 Remarkably, no military officers were invited to the Tuesday luncheon until October 1967, and in at least in the first phase of Rolling Thunder the political consistently trumped the military. As targets worked their way up the command hierarchy to Washington, their priority order was reversed; the bomb line slowly advanced northward as strikes worked their way up from the bottom of the strategic list. 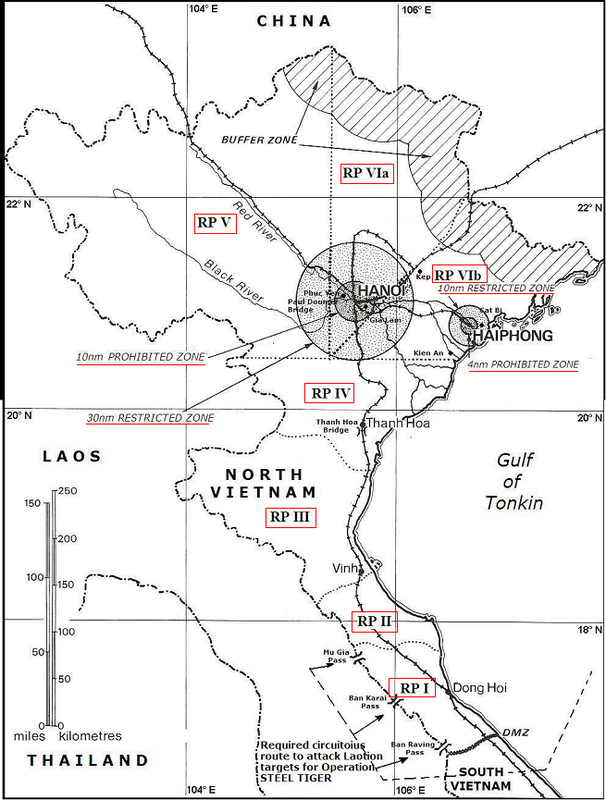 In addition to selecting targets, Johnson stipulated strict Rules of Engagement – so stringent that one airman described them as ‘rules of defeat’ – that prohibited air strikes within 30 miles of the Chinese border, 30 miles from the centre of Hanoi and 10 miles from the centre of Haiphong, and imposed a complex, constantly changing web of regulation whose details had to be incorporated into every day’s operational order. The paragraphs above are culled from my ‘Lines of descent’ (DOWNLOADS tab) and they describe an ideal-typical sequence of decision-making, but the most detailed published account is David Humphreys, ‘On the Tuesday Lunch at the Johnson White House: a preliminary assessment’, Diplomatic History 8 (1984) 81-101; see also David Barrett, ‘Doing “Tuesday Lunch” at Lyndon Johnson’s White House: new archival evidence on decision-making’, PS: Political science and politics 24 (4) (1991) pp. 676-9, Kevin Mulcahy, ‘Rethinking Groupthink: Walt Rostow and the National Security advisory processin the Johnson administration’, Presidential Studies Quarterly 25 (1995) 237-50, and Johanna Kephart, ‘Presidential decision-making and war: testing the evolution model’, MA thesis, Georgetown University (2010) here (especially pp. 8-27). Pakistan is not Vietnam, of course, and there are obvious differences between the two campaigns – as well as remarkable ‘lines of descent’ – but the role of the sovereign in asserting ‘the right to take life or let live’ is a grim constant. This entry was posted in bombing, drones, Vietnam and tagged Lyndon B. Johnson, Terror Tuesdays, Tuesday Lunch by Derek Gregory. Bookmark the permalink. Thanks very much! I’ve been in touch with Oliver. And I’ll keep in touch with you. Cheers! Stuart: Thanks so much for this – it’s a very helpful and productive post. One of my PhD students is working on a genealogy of counterinsurgency – amongst other things – and he too is interested in the social-scientific methodologies you outline in your paper abstract, so I’ll put him in touch with you. But your comments about the Tuesday Lunch are extremely interesting; I only touched on it briefly in my “Lines of descent” essay because I simply (!) wanted to show that many of the elements of today’s networked operations were being moved into place during the wars in Indochina (and in some instances even earlier). You show wonderfully well the significance of the wider political-administrative structures within which decisions were being taken and, just as important, the ways in which these spiralled from the air war into counterinsurgency operations on the ground and back again (and, by implication, their dispersal across Indochina and, indeed, beyond). I hope we can keep in touch! I wrote a rejoinder to this post on my newish blog, Epistemological Impossibilities: http://stuartschrader.com/lyndon-johnsons-tuesday-lunch-hold-counterinsurgency. Would be interested in your thoughts.